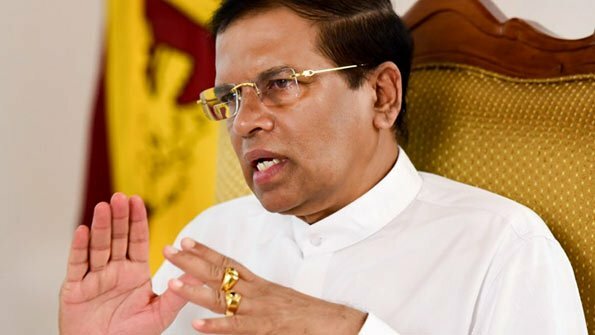 “If any unauthorized buildings or environmental pollution happens damaging the canal and river preservations in any area, strict actions will be taken against the responsible government officials in the areas”, emphasizes President Maithripala Sirisena. “The government is committed to protect the public servants who fulfill their responsibilities properly. Similarly, the government will not hesitate to take action against the officials who don’t execute their duties”, he added. President Sirisena was speaking at the ceremony to declare the National Environment Week, implemented in parallel to the World Environment Day falls on the 5th of June. The ceremony was held yesterday (May 30) at the Sevamuktha Kandavura Maha Vidyalaya, Polonnaruwa. The period from May 30 to June 05 will be the National Environment Week. Large number of environment programs has been organized island wide to be held during this week. “We should curse not the rain but those who destroyed the environment for the terrible conditions we faced due to the flood and earth slips, caused by adverse weather conditions”, the President said. He recalled that the people who lived in the unauthorized houses in the Kelani River Reservation and in the buildings on water ways, had to suffer from the flood for number of days. “The politicians and the government officials are the people who should be responsible for that”, the President further stated. The President said that our country has a rich history in protecting natural resources and the quality of biodiversity, but during the past few decades as a result of arbitrary actions by some politicians paved the way for environmental destruction. He also said that all of us should be aware of the tragedy the world has to face tomorrow because of the increasing environmental damage. It is the responsibility of all of us to implement development activities while protecting the environment. Contributing to the National Environment Week activities is not a responsibility only limited to the Ministry of Environment, the President said that adding the active participation of all State and Private institutions, school children and the general public is also important in this regard. President Sirisena planted a Na sapling at the school premises to mark the Tree Planting Programe implemented in line with the National Environment Week. Gold medals were awarded for the Environmental Pioneer Brigade in the Dimbulagala area. During the event the plants were distributed among the school children and the public. North Central Province Chief Minister, Peshala Jayarathna, Mahaweli Development and Environment Deputy Minister Anuradha Jayaratne , Mahaweli Development and Environment Ministry Secretary Udaya R . Seneviratne, school children and residents also participated at this occasion. The President also presented felicitation awards to two senior members of the Co- operative Society of Palugasdamana. ‘Strict actions against government officials for any unauthorized building or environmental pollution – President’, good to hear this President! What about starting to take action against those who involved in harming the bio-diversity in Wilpattu National Park?